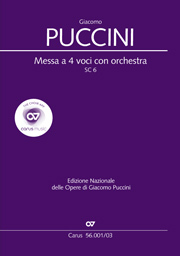 HomeSearch result for "messa di gloria"
Puccini composed his Messa a 4 voci con orchestra in 1878–1880. 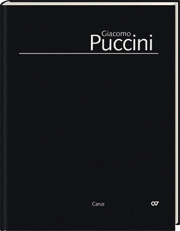 The musical quality, the energy, and the freshness of this youthful work led the composer to quote from his Mass in later operas, ensuring an ever-growing popularity for the work after its rediscovery in 1952. With this arrangement for chamber orchestra (flute, oboe, clarinet, horn, bassoon, timpani, and strings), more choirs now have the opportunity of performing this work without the choir being dominated by a full-scale symphony orchestra. 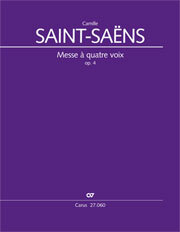 The symphonic character of the work is nevertheless preserved. This scoring offers an optimal balance between transparency and orchestral sound. 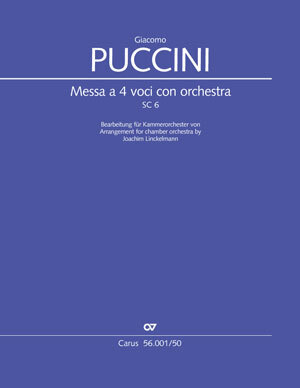 All the vocal parts (soloists and chorus) are identical with the original version (56.001), so that the vocal score and chorus score of that version can be used.